Back in the 1970's singer songwriter Mac Davis wrote the song "I Believe in Music." I remember the song well, It was not one of Mac's biggest hits. That's a shame for a song that proclaimed "music is the universal language." At the 2010 Delaware State Fair my then teen age daughter joined me for a Lynyrd Skynyrd concert. As I watched the fans of Skynyrd Nation, I saw as many fifty year old fans, as I saw twenty something fans, all having a great time together. The idea that music is the universal language was validated by my daughter who joined me, and told me at the end of the evening how much she really enjoyed the concert. As someone who studies music and philosophy, I often see comments on the differences in generations, and how these differences are often marked by differences in music. Many years ago I did a work shop for a social services agency with people from very diverse backgrounds. I used music as way to start conversations, and find common interests. I don't beleve the music is what divides, but is indeed that universal language that brings us together. We apply the principles of the philosophyguru, not to promote specific beliefs, but to help you understand ideas and philosophies, in order to stretch your mind. On our journey through rock music history we reflect upon some of the greatest artists in the world of music with the hope that perhaps you will look at some of these musicians and their music in a way you never have before. First we dare to answer the question, who are the greatest rock bands of all time. The answer to the question who is the best rock band ever is one that can change based on the mood of the person answering the question. The best, as in what regard? The most successful? The most influential? Just someone we like to hear? After we look at some of best rock bands ever, we take a look at some of the best rock musicians that made the music stand out in our memory. Rock stars and famous musicians are known for living on the edge and dying young. Many great music artists died at the peak of their careers, Some died so very young, and their legacy has grown so large after their death. We have mixed in some stories of the many great artists who died in their prime. Drugs and alcohol abuse has claimed the lives of many rock stars and musicians. But not every untimely death is because of substance abuse. The constant traveling is perhaps why aircraft tragedies have caused so many promising stars to die young. 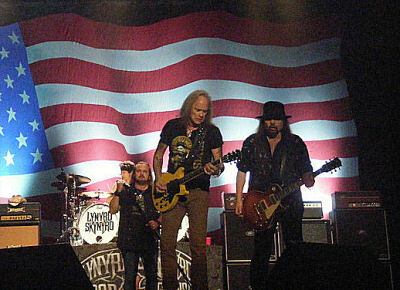 Photograph:Lynyrd Skynyrd concert at the 2010 Delaware State Fair property of Tom Peracchio. All rights reserved..